Holy Scripture recounts how God in love envisioned a creation that was a reflection of the very nature of God, which is love. But somewhere along the line humanity decided that being a reflection was not enough, but wanted instead to be the creator. Ever since that time, we have been on a path of loving and not loving enough; about seeking union with God and about seeking that union on terms which we want to define. It is about falling down and being raised up again through the mystical love that had once envisioned us. Throughout time, attempts have been made by visionaries gifted by the Holy Spirit who call us to new beginnings. Our particular history begins in the 6th century with a young man called Benedict. Some could say that his initial attempts at founding a community were met with mixed results. There were tensions to say the least. Benedict’s first community found his constant call to follow his moderate Rule too harsh for their taste and tried to kill him. His relationship with the local priests was strained as well, as people sought his spiritual guidance rather than theirs. For this a local priest tried to kill him. St. Francis a few hundred years later experienced something similar. He had envisioned small communities of individuals who shared the life and poverty of those around them. Within his lifetime, the community moved further and further away from the original vision he had for them. This is the cycle we have created for ourselves from the very beginning: the process of moving away from our intentions, falling down, and getting back up. If it were not for the Incarnation of God made manifest in Christ, our hope of every letting go of this cycle would die with us. God-given in 1992 to Abbot Michael-John, the vision that is revolutionizing Anglican Benedictine life for the 21st century calls the House of Initia Nova home. Benedictine life is the pursuit of union with God hallmarked by individual prayer life, communal prayer offices, work, and ministry. 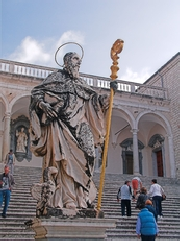 The House of Initia Nova is rooted in the ancient tradition of the Rule of St. Benedict. Through the 1,500 years since the writing of the Rule, Benedictines have taken the model of the Rule and modified it to meet historical and cultural needs. Initia Nova continues this tradition by opening new possibilities for monastic life in the new millennium while remaining a school for the Lord’s service. No longer exclusively bound by monastery walls, the Lord’s service is exercised not only at the Abbey but in the world, in God’s creation. In Chapter 4 of the Rule, St. Benedict encourages his followers to relieve the lot of the poor, clothe the naked, visit the sick, bury the dead, and console the sorrowing. These tools for good works are a beginning point for Christian living. Based on individual skills and interests, each member discerns how these tools for good works will be practiced in their lives. As Benedictines, we see our threefold vows embedded in our baptismal vows, calling us to a daily death and resurrection made possible in Christ.